“No man ever reached excellence in any one art or profession without having passed through the slow and painful process of study and preparation,” thus Horace once said. Teacher Ricky Santos, teachers, parents, fellow Kumon students, friends and guests, good afternoon. Education is one of the very important aspects of the development of a person. It determines the future of a being as he encounters bumps and surpasses loops along his way of acquiring knowledge. It brings confidence to face the growing complexity of the world and the ever more changing situations one may be into. Thus, having good education gives an individual the sharpest edge to be able to stand out in this complicated earth. Kumon is one of the greatest sources of good education. It develops not only brains but also character and attitude which are far more important than any knowledge. It brings the best in any student as he climbs the ladder of excellence with determination and perseverance. In my three years of studying in Kumon, I can say that I’ve become the best of who I want to be in many ways. It sharpened my knowledge and molded my inner self as well. I used to be an underdog in Math when I was in elementary up to my year one in secondary. I know very well how difficult Math is and why a lot of students hate it and consider it as a huge problem. It is still in my memory that I was using my fingers to perform simple addition and subtraction during those days. And how can I forget the time when I used to list the multiplication table during exams just for me to answer my test questions. Freshman days in high school were not so good for me. And so, during the vacation that year, mom decided to enroll me in Kumon. AND NOW, HERE ENTERS KUMON IN MY LIFE. First impression? Oh man..grrrr. I was afraid to enter the institution for I see it as a room only for students who have unusually large head and/or bulging foreheads. I’m not one and I never dreamt of becoming one. But I was determined to make a difference in myself, so I took the challenge. I started level B in Math Program April of 2007. That seemed very low for a 13 year old doing subtraction, I thought. I was even ashamed for a while. But then, that’s it, I could do nothing to change my starting level. I just did my best in each sheet that I was tasked to do. And so days passed and my level was getting higher and more advanced. Level G, H then M, N and O! I pushed myself in every sheet. I did everything I can in order to be in time and accomplish every item accurately. It was not easy. It was never easy especially when school assignments and projects come in the way. It was not easy when there will be a report and five quizzes the next day. It was not easy when periodical examinations will occur the following three days. But never quit. I did my best even though a lot block the way. And now, after three successful years, I finished and completed Kumon Math Program. It’s just a matter of perseverance and urge to be successful. And for now, Kumon had done me lots of miracles. The previous fear in Mathematics had now vanished. Math is pretty simple. Math is now easy. And I’m proud, that Kumon is there, to help students cross the right road towards the fulfillment of dreams. For all of you here, do your best and never get tired of acquiring knowledge. You’ve enrolled in a great institution so don’t waste the given chances. For those who are thinking of quitting, nah…forget it. You’ve enrolled in an institution that says: WE ACCEPT NO QUITTERS. I would want to take this opportunity to thank our Kumon teachers for their undying effort to push us to what they know we can be. I personally thank Teacher Ricky for never giving up on me. Teacher Chris, thank you for being my teacher for the most part of my journey. To my previous teachers, thank you for building the foundation of what I’ve attained now. “Uncover your boundless potential,” thus one of the Aspire’s issue says. Teacher Ricky Santos, teachers, parents, fellow Kumon students, friends and guests, good morning. When my mom told me the other night that I was tasked to deliver this testimony, I couldn’t think of anything to say. For one reason, I was doubtful if what I’m going to say will be right and appropriate for the occasion. Second, I really don’t know what to say. Ever since a five-year-old kid step his foot on the grounds of a creepy and scary school, a massive input of knowledge awaits the excited pupil. From a simple ABC and 123, until he may master all equations, the processing of knowledge still continues and never will it stop. Thus, Kumon is one of the greatest sources of knowledge for any student. I’ve enrolled in Kumon for nearly two years now and I consider it as a great help not only in my academics but also in my life. And for sure, for every student who is seated here now, you’re thinking of the same thing. I was once an underdog in Math and I know how difficult Math is. I remember my grade school years when I’m using my fingers to perform addition and subtraction. And how can I forget the time when I used to list the multiplication table during exams just for me to answer my test questions. And so here comes Kumon. At first, I was afraid to enter the institution for my first impression was that all students were brainy and I don’t even deserve one corner of the school. But I was determined to make a difference in myself, so I took the challenge. And for now, Kumon had done me lots of miracles. The previous fear in Mathematics had now vanished. In fact, it’s the subject that challenges me the most and pushes me to do more and strive more. Thanks to Kumon, I can now go head-to-head and toe-to-toe with our Best Math Student. In fact, I’m a consistent contestant in Math tournaments in and out of our school. And I’m proud, that Kumon is there, to help students and fulfil their dreams. Yet, I know, it is not that easy to surpass every worksheet. We encounter problems and calculations that are hard to understand. We get irritated if we cannot answer and thought of quitting. In fact, I know some of us now are planning to hold off. Well, that’s a challenge for us. We are urged to do our best and overcome our limits. We are asked to UNCOVER OUR BOUNDLESS POTENTIAL. And in fact, Kumon says: We accept no quitters. Yet Kumon is not merely seen on what it teaches. For me, the knowledge is just half of what Kumon can offer. The FRIENDSHIP and CAMARADERIE that revolves around with the students occupies the other half of the institution’s goals. Knowledge will be nothing if we do not have friends to share it with. It is, indeed, but inspiring that Kumon does not only offer quality education, but the real essence of how life should go – FRIENDSHIP. Let me take this opportunity to thank all persons who were involved in our success and victory. Let us not forget to thank our parents who had given us all the opportunities to study in this prestigious school. Thank you, our dear parents for all the sacrifices you’ve done for us. And who would forget our teachers here in Kumon? To our teachers, who now became our second parents, thank you very much for believing in us, compelling us and teaching us to explore our talents that lie within ourselves. Without you, this institution would mean nothing. Thank you very much. As we celebrate this Yuletide season, let us always remember, and may it be always instilled in our hearts and minds, that Kumon had been one of God’s greatest gifts to each of us. It is indeed one of His extra special presents for us this Christmas for we gained new knowledge, gained new friends, learned from our mistakes, and learned from our mentors. May Kumon and its goals be an inspiration for all of us to celebrate this season with smiles flashing from our faces and joy bursting from the deepest parts our hearts. As I end this speech, let me share to you one quote. “Happiness in life is not measured on one’s success or victory. It is measured by how we played the game.” Let us always UNCOVER OUR BOUNDLESS POTENTIAL. “The pain of parting is nothing to the joy of meeting again,” thus said Charles Dickens. Sr. Teresita Capurihan, SPC, directress and high school principal, Sr. Sosima Ramos, SPC, grade school principal, Fr. 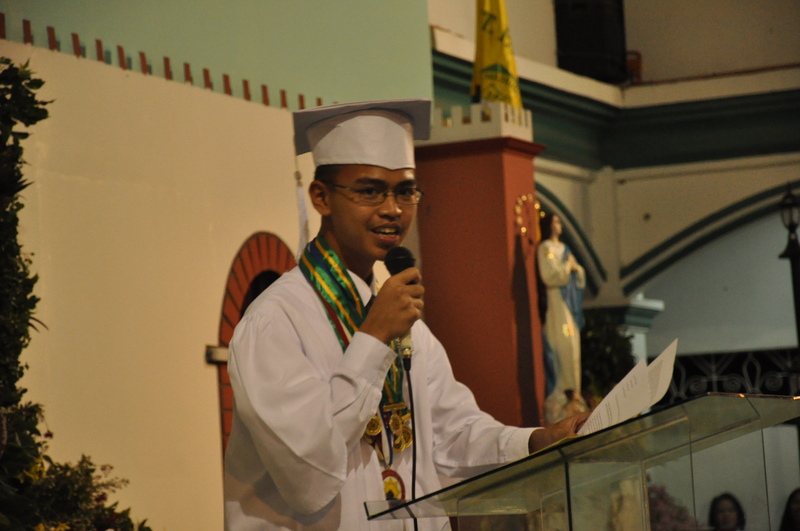 Bonifacio Ampoyas, sisters, parents, teachers, friends, and fellow graduates, good evening. In a few moments from now, each of us will officially wave goodbye to St. Paul. In a few moments, each of us will hug our friends, kiss our parents, and thank our teachers. In just a few more minutes, we will start sobbing in tears yet we’re going to flash our smiles. In just a short while, we will start missing each other, we will start searching for each other’s company, we will start recalling the days that we’re together. A little more time left and we’re going to leave memories, we’re going to face new life, we’re going to be away from each other, we’re going to depart, we’re going to sign off. Graduation is not only a ceremony of acquiring recognitions but it is a day to make us realize that our sacrifices and efforts have finally bear fruit. It is a day to reward us of our determination to surpass any obstacle that came to our way and stand whenever we fell to our knees. It is a time to recognize our passion to learn and our hunger for knowledge. It is a day to hail each of us for being the best of who we are. Today, we’re here, wearing our togas and having shining gold pieces on our necks. Some are smiling and rejoicing while some do not want to say goodbye yet. It is hard to forget every moment that we shared together. The laughter and the bonding that we had are not easy things to let go. Our classmates and friends to whom we’ve opened ourselves and shared our thoughts are surely never easy to forget and lose grip of. The days that we cried and thought to give up, which helped us to become firm and strong, will never be detached from our memories. Our teachers, may they be our idols or our worst nightmares, will surely book a part of ourselves. High school life is just simply the best. And now, let me grab this opportunity to thank our teachers who taught and instructed us every single piece of knowledge that we need. Teachers, thank you for being our second parents here in school. Thank you for believing in our capabilities, for understanding our weaknesses and failures, for rendering us your patience whenever we become naughty and whenever we copy assignments, seat works and quizzes from each other. To Tatay Nic, maraming salamat po. My fourth year in high school will never be complete without you, our great adviser. Thank you for believing and supporting me and rendering our Nicaloysian family all the joy, care, guidance, and love that we need. Thank you for making us realize what life is. To Mr. Andallo, our very adorable and very handsome Math teacher, thank you for all the moments that we shared. Thank you for your jokes, for your undying effort to teach us every Math concept that we need. I will always remember your lines whenever we find it hard to solve problems: “O diba, napakadali lang yan?” sabay pamewang sa bulsa at kumpas ng kamay. On behalf of St. Anthony, I thank you, together with Mrs. Isidro, for your excellent mentoring with them. To Ms. Pablo, my BULPRISA coach for this year, thank you very much for helping me improve in my field. Thanks for the happy moments that we always had during our English classes. On behalf of St. Christopher, thank you for believing in them and serving as their mother during their fourth year. To Ms. Catu, I personally thank you for being one of my favourite teachers in high school. You’re the kindest and the only teacher that I know who never gets angry. Ma’am thanks a lot. To Mrs. Cruz, my Press Con mentor, campus paper adviser, ang ina ko at ina rin ni Carlo, thank you for always trusting me that I can do anything. Thanks for fighting for us PT staffers. Thanks for your guidance and support. To Mr. Binuluan, thank you for trusting me as your Cor commander for this year. I never thought of having such position. Thank you very much sir, especially for all the military training and camping that we had. To all our teachers, especially our fourth year mentors Mrs. Birco, Mr. Francisco, Ms. Saccuan, Ms. Galapon, Mrs. Guansing, Ms. Lajom, and Sr. Beth, thank you for all the days that we shared. To my previous teachers, especially Mr. Amarila and Ms. Cabaddu, thank you. Also I thank my teachers in the elementary, especially Mr. Tuppal, for your support until today. We thank our families, especially our dear parents for loving us and giving us the chance to study in St. Paul. Thank you for all the sacrifices and hard works that you’ve done for us. You never let us down throughout the years, which shows that you really love us and care for us. To my parents, thank you for everything that you’ve done for me in the 16 years of my life. I love you very much! To my brother, thanks for giving me all the joy that I need. To our friends, who became our source of inspiration and joy, thank you very much for always staying by our side and never leaving us whenever we have problems. Our gratitude for the time and bonding that we had, for the friendship and camaraderie, for understanding and believing. To Ives, JB and Edwin, 12 years of friendship is way too long and strong for the four of us. We have built a strong pillar that will surely guide us as we journey through life. We have shared the good and the bad, we’ve spent time together, we stay to stand firm after all these years. Thank you for everything. You are my best friends who are with me always. I will always treasure in my heart every second that we had. To Reysa and Kevin, thanks for being such friends to me. Reysa, thanks a lot for the friendship that we’ve built in high school. I was surprised that we became friends after our wars in elementary. Kevin thanks for accepting me as your friend. Thank you for your helpful advices and for the intelligent words you’ve been telling me in high school. To Sarah, thank you for being such a great friend to me. Thank you for listening whenever I open to you my problems. You’re the best seat mate I had. Thanks for believing in me. You’re simplicity will always be in my heart. You’re smiles will always be with me. You’re the best. To Ellice, high school life will never be complete without you. Two years of quarrel is enough for me to consider you as an enemy. But destiny is really playful. The last two years of my stay here in St. Paul made you as one of the biggest part of my life. Thank you for being the first person to make me smile completely, for never forgetting to make me happy, for loving and caring, for being always there. Thank you for everything you’ve done for me. We thank all the sisters for your genuine appreciation of everything we do. Thank you for forming us as great Paulinians, who always put God in the center of our lives. Thank you for teaching us good works and deeds and for influencing us to become better person each day. Sr. Teresita, thank you for being a good directress to us. Sr. Madeleine, thanks for making us realize that love of Christ is surely the best. Thank you for considering us as your first love. Sr. Beth, thanks for being a great teacher. Sr. Concepcion, thank you for always wearing a smile to each of us. Sr. Sosima, I thank you for your trust and support even up to now that I soon will enter college. Most of all, we thank the Lord, Almighty for giving us the courage and love to do anything within our capacity. Thank you, Lord, for your guidance and protection. It has been said that high school is the best four years of our lives. Yes, it is true. But let us always remember, just like what Elisabeth Adams said in her Valedictory address in 1999, that the best years of our lives should lie ahead, because now we finally have the ability to shape what kind of life we would like to lead. We may not all become rich and famous someday, but every one of us has the choice and the chance. What matters most though is not fame and money but the people that we love and love us back, the friends that we have, our parents, our mentors, our God. All of them, we had in high school. The clock is ticking fast now. The gates are now open for us to enter a more complicated world. We are going to be in a new life, new situation with new people, new friends, and new environment. Yet let us always remember the values that we got in St. Paul. We are Paulinians in words and in deeds. Let us always have the Paulinian in us, for St. Paul always live in our hearts. Now, as we say goodbye to each other, may our memories last forever. We may be distant physically for each other for a time, but not for long…not for long. Our days as friends and batch mates are in us, our minds and hearts will always be one. As I end this speech, let me leave you with this: “To live is the rarest thing in the world,” said Oscar Wilde. “Most people simply exist.” Let’s be determined to live.